Imagine a comfortable and cozy cottage close to one of the most scenic hikes, the Baldface Circle trail, in New Hampshire with access to 100+ trails in Chatham and the surrounding Caribou Mountain ranges. This cozy cottage off Main Road in North Chatham is within walking distance to the AMC Cold River camp. Check in to the cottage after driving up from anywhere in New England (or any country) and unwind with familiar comforts and connectivity your home offers. The cottage can host up to six people with all the necessary amenities & access to WiFi for your online activities, e.g. facebooking/tweeting, or keeping the office happy. Use this as a base to explore all the best that North Chatham and the surrounding areas have to offer in comfort. This is a great alternative to AMC Cold River camp. Please come and join us for good ole Mountain hospitality. Having lived overseas for 20+ year, I decided to change the direction of life and came back to NH to live full time 2 years ago. I am now a freelance financial consultant, and a student in homeopathy and herbal medicine. 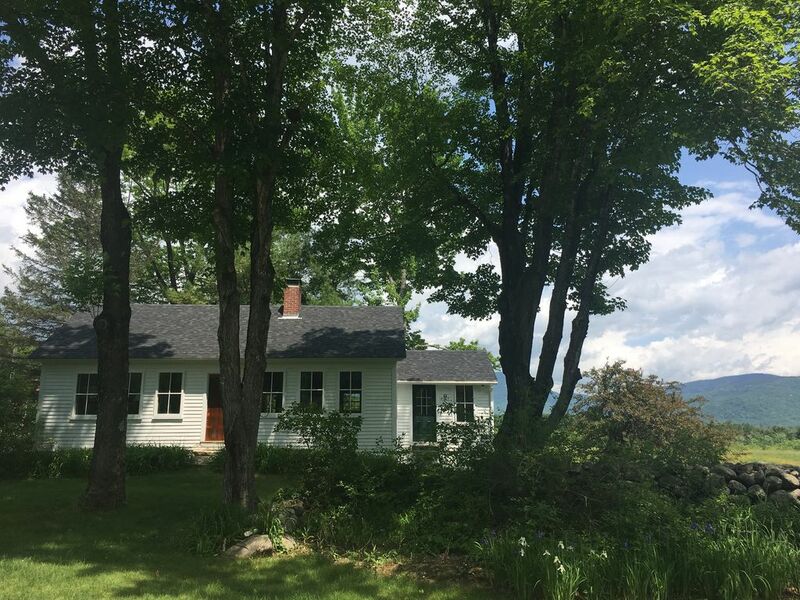 The cottage I am offering has been used as a family/friend guest house and I'd like to provide it to HomeAway members as a base to stay and explore the White Mountain areas. I also believe it is a great way for me to get to know new friends. I am certainly looking forward to hosting. The cottage was a primary school house turned a single family home that contains 1,090 sq ft and built in 1840. One of my guests told me it is the "cutest house I have ever seen". It is close to all the trails and natural sceneries that North Chatham has to offer, with all the modern necessities (e.g. Wifi) included. The cottage can host up to six people with all the necessary amenities & access to WiFi for your online activities. Use this as a base to explore all the best that North Chatham and the surrounding area have to offer in comfort. What made me fall in love and bought this place .... the potential for a well designed backyard vegetable/flower garden, the million-dollop view of the Laughing Lion Mountain in the back that I see every day, and the 100+ trails that Chatham offers. Another attraction is the brook that runs through the property. It sounds like a lullaby that helps me sleep every night. A full bathroom with a shower stall and all necessary amenities included. The Lake Kezar Country Club in Lovell Maine is about 14 miles from the Cottage and 20+ minutes drive. It offers four sets of tees on every hole to accommodate any level of golfer. The cottage is situated in the White Mountains area, with over 100 trails around for guests to use. There is a private brook running through the property in front of the cottage. Guests are welcome to use the brook for fun with safety rules to apply. Internet VOIP phone is provided. Electric heating plus a brand new Rinnai gas heater. Wood stove in the living room. A wood stove is installed in the cottage. If guests are not familiar with operation of a wood stove, host can help if a fire is needed to keep the place warm (especially during power outage). Dishes and utensils are included for six guests. A separate dining area to sit 6 guests are included in the cottage. Roku WiFi TV with YouTube TV, Netflix and other Apps installed. A bluetooth sound bar is provided. A library of books are offered in the cottage. A well maintained lawn and garden is outside the cottage, and lawn chairs are available for guests to sit and enjoy the mountain view in the back. All beds and appliances are new in the cottage. The master bedroom can host 2 guests in a king size bed, 2 guests in a brand new bunk bed in a small bedroom, and 2 extra guests in 2 full beds in a fun loft. All kitchen appliances and utensils are new and fully equipped for you to cook a meal on your own. Host will provide some food for breakfast in case guests run out of breakfast items. Other appliances include a microwave, rice cooker, and coffee maker. A newly installed RO drinking water system is also installed for your hydration needs. Private garden in front of the cottage, and a brook running through the property to dip in in a hot summer afternoon (with strict safety rules to apply). The host lives in the brick building next to the cottage to help during normal hours. Jason has a fantastic property and he was the consummate host. Great communication and a well stocked cabin. Thank you and your family for the opportunity to host you all. It was a pleasure indeed. Also thank you for keeping my place in an immaculate condition. It is much appreciated. I hope to see you all back again some time. We loved our few days at the cottage. It was immaculately clean and Jason has thought of every convenience to have when you’re away - from toiletries to kitchen utensils, even farm fresh eggs & OJ in the fridge. He also welcomed our dog without any issue, and had dog treats for him! Amazing view of the White Mountains! All in all fantastic! Highly, highly recommend and definitely want to come back and stay again! We really enjoyed our stay for several reasons. The property was spotlessly clean and the sheets and towels were cleaned with baking soda as I had requested due to my sensitivities to scented detergents. The sofa and bed were very comfortable, and the wood stove was very cozy. We enjoyed hours of reading in front of the fire. Jason was a gracious, generous host. We hope to stay again sometime. We enjoyed the mountain drive through Evans Notch to get to North Chatham. The house was perfect and we loved getting to use the wood stove. Waking up to the Mountain View’s made it a perfect NH trip. This is a great retreat for hikers - peaceful, comfortable, and perfectly located. Our vacation was a mix of sun and rain, so we were delighted to have this cabin to enjoy when it was too wet for hitting the trails. Jason was a wonderful host, very accommodating and helpful but never intrusive. The cabin greeted us with fresh flowers on the table and basic necessities like milk and eggs already in the refrigerator, and a wonderful library of books, particularly nature books, to read when the weather turned bad. The king sized bed was comfortable and we really appreciated the motion-activated nightlights. The last night, Jason advised us that the stars would be worth seeing, and they were spectacular! We definitely plan to come back next year. Wonderful stay! Caring and attentive host. Great hiking trails. In walking distance. Closest store even had gluten free options! The most Homeaway proivdes is a 5-star rating system, but I think you deserve a 6-star instead. You were one of the best guests I ever had. You are the type of guests that make hosting a pleasant experience.